Ubuntu Linux, Day 12: VPN Success, Finally! If you have been following along, then you know I have had my share of issues thus far in my 30 Days With Ubuntu Linux journey. One thing that stands out for me as a plus so far, though, for Linux--or at least for Ubuntu Linux--is the Ubuntu Software Center. 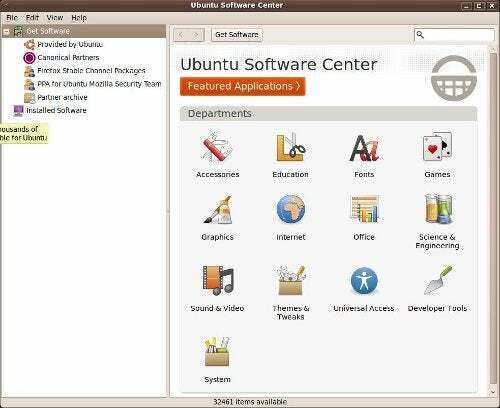 You can find a wide variety of apps and tools in the Ubuntu Software Center. RickDobbelmannqbtt posted, "Get to know the software center. It is an app store but virtually everything is free." ChrisHardeetd21 said, "Really the next step should be the Software Center. Just load it up and start searching for apps, you'll find plenty of cool stuff to blog about." KrisStewartjto9 told me, "If you want to manage your empty 50GB partition, I suggest GParted which I find more useful then [sic] the Windows alternative Partition Magic. You can find it in the Ubuntu Software Center." OK. I get it. It is like the Linux equivalent of "there's an app for that." I don't have a Mac, but I imagine that the Mac App Store is similar in scope and concept too--except that the Mac App Store seems to have more of a commercial software focus while the Ubuntu Software Center has predominantly free open source tools. Just click on the Ubuntu logo at the upper left and select Ubuntu Software Center in the Ubuntu Classic desktop, or just click the Ubuntu Software Center tile (the icon looks like a grocery bag with the Ubuntu logo on it, filled with apps) in the Unity interface, and you are ready to shop. The default screen displays a variety of departments--or categories--of software, including Accessories, Education, Games, Internet, Science & Engineering, System, Universal Access, Developer Tools, Fonts, Graphics, Office, Sound & Video, and Themes & Tweaks. Or, if you are looking for something in particular, you can use the search field at the top of the window. While browsing the departments may uncover some interesting apps, it can also be overwhelming. If you go into Accessories, there are 336 items listed in alphabetical order with no other filtering or grouping to help narrow down what you're looking at. Games has 507 apps, but at least Games does break things down into different types of games (arcade, simulation, sports, etc.) to help you find what you're looking for.